Recently, emails purporting to be from Keith Olbermann, the suspended MSNBC news anchor, surfaced showing a disgruntled Olbermann. Olbermann denied authoring the emails. Conservative pundit and Daily Caller editor Tucker Carlson perpetrated a hoax last weekend by posing as Keith Olbermann in a series of emails to a Philadelphia columnist. The incendiary emails seemed too good to be true -- and they were. They were sent from keith@keitholbermann.com. That's an address that is not owned by Olbermann, but by Carlson. In July, Carlson announced that he had purchased the domain name KeithOlbermann.com, and told Politico that people could email him at Keith@KeithOlbermann.com -- the same address that the emails to Bykofsky came from. On Tuesday night, Yahoo's Michael Calderone reached Carlson by phone. Carlson confirmed that he had, in fact, sent the emails posing as Olbermann. "Could you resist?" Carlson said. "It was just too funny. The flesh is weak." 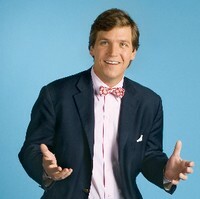 The former bow tie-wearing conservative pundit, Tucker Carlson, seemed to think it would be great fun impersonating someone else through electronic means, but what he didn't realize was that he committed an act of computer fraud. According to WiseGeek, simple forms of computer fraud include "sending hoax emails intended to scare people" and "Illegally 'posing' as someone else on the Internet." These forms of fraud could easily advance to more complex forms. Sure Carlson thought it was good fun pretending to be Olbermann disparaging his MSNBC bosses, but his actions could have caused serious damage, potentially damaging Olbermann's reputation and career. If you notice, conservatives have been perpetrating acts like this for some time, and when they get caught breaking the law they simply claim they were only having a little fun - remember James O'Keefe's prank fraudulently entering Mary Landrieu's office and attempting to get into her telephone cabinet or his attempt to sexually harass a CNN reporter? Can you imagine what would have happened if Olbermann pretended to be someone like Andrew Breitbart, Tucker Carlson, or James O'Keefe in an email? In my opinion, Olbermann should seek legal actions against Carlson to prevent any future attempts by the conservative pundit to smear Olbermann's name. It's called identity theft and should be punished.